"Coastal waters" redirects here. For geographical aspects, see coast. Schematic map of maritime zones (aerial view). The term territorial waters is sometimes used informally to refer to any area of water over which a state has jurisdiction, including internal waters, the territorial sea (see below), the contiguous zone, the exclusive economic zone and potentially the continental shelf. In a narrower sense, the term is used as a synonym for the territorial sea. Normally, the baseline from which the territorial sea is measured is the low-water line along the coast as marked on large-scale charts officially recognized by the coastal state. This is either the low-water mark closest to the shore, or alternatively it may be an unlimited distance from permanently exposed land, provided that some portion of elevations exposed at low tide but covered at high tide (like mud flats) is within 12 nautical miles (22 km; 14 mi) of permanently exposed land. Straight baselines can alternatively be defined connecting fringing islands along a coast, across the mouths of rivers, or with certain restrictions across the mouths of bays. In this case, a bay is defined as "a well-marked indentation whose penetration is in such proportion to the width of its mouth as to contain land-locked waters and constitute more than a mere curvature of the coast. An indentation shall not, however, be regarded as a bay unless its area is as large as, or larger than, that of the semi-circle whose diameter is a line drawn across the mouth of that indentation". The baseline across the bay must also be no more than 24 nautical miles (44 km; 28 mi) in length. Internal and external territorial waters of the Philippines prior to the adoption of new baselines in 2009. Waters landward of the baseline are defined as internal waters, over which the state has complete sovereignty: not even innocent passage is allowed without explicit permission from said state. Lakes and rivers are considered internal waters. All "archipelagic waters" within the outermost islands of an archipelagic state such as Indonesia or the Philippines are also considered internal waters, and are treated the same with the exception that innocent passage through them must be allowed. However, archipelagic states may designate certain sea lanes through these waters. Territorial sea, as defined by the 1982 United Nations Convention on the Law of the Sea, is a belt of coastal waters extending at most 12 nautical miles (22.2 km; 13.8 mi) from the baseline (usually the mean low-water mark) of a coastal state. The territorial sea is regarded as the sovereign territory of the state, although foreign ships (military and civilian) are allowed innocent passage through it, or transit passage for straits; this sovereignty also extends to the airspace over and seabed below. Adjustment of these boundaries is called, in international law, maritime delimitation. A state's territorial sea extends up to 12 nautical miles (22.2 km; 13.8 mi) from its baseline. If this would overlap with another state's territorial sea, the border is taken as the median point between the states' baselines, unless the states in question agree otherwise. A state can also choose to claim a smaller territorial sea. Conflicts have occurred whenever a coastal nation claims an entire gulf as its territorial waters while other nations only recognize the more restrictive definitions of the UN convention. Claims which draw baseline in excess of 24 nautical miles (two 12 NM limits) are judged excessive by the U.S. Two conflicts occurred in the Gulf of Sidra where Libya drew a line in excess of 230 NM and claimed the entire enclosed gulf as its territorial waters. The U.S. exercised freedom of navigation rights twice, in the 1981 and 1989 Gulf of Sidra incidents. In the U.S. federal system, individual states exercise ownership (subject to federal law) up to 3 nautical miles (9 nautical miles for Texas and Florida) from shore, while the federal government exercises sole territorial jurisdiction further out (see Tidelands). The contiguous zone is a band of water extending farther from the outer edge of the territorial sea to up to 24 nautical miles (44.4 km; 27.6 mi) from the baseline, within which a state can exert limited control for the purpose of preventing or punishing "infringement of its customs, fiscal, immigration or sanitary laws and regulations within its territory or territorial sea". This will typically be 12 nautical miles (22 km; 14 mi) wide, but could be more (if a state has chosen to claim a territorial sea of less than 12 nautical miles), or less, if it would otherwise overlap another state's contiguous zone. However, unlike the territorial sea, there is no standard rule for resolving such conflicts and the states in question must negotiate their own compromise. The United States invoked a contiguous zone out to 24 nmi from the baseline on 29 September 1999. 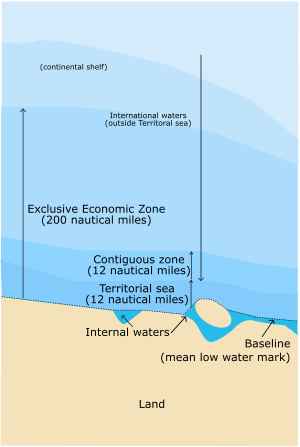 An exclusive economic zone extends from the baseline to a maximum of 200 nautical miles (370.4 km; 230.2 mi), thus it includes the contiguous zone. A coastal nation has control of all economic resources within its exclusive economic zone, including fishing, mining, oil exploration, and any pollution of those resources. However, it cannot prohibit passage or loitering above, on, or under the surface of the sea that is in compliance with the laws and regulations adopted by the coastal State in accordance with the provisions of the UN Convention, within that portion of its exclusive economic zone beyond its territorial sea. Before the United Nations Convention on the Law of the Sea of 1982, coastal nations arbitrarily extended their territorial waters in an effort to control activities which are now regulated by the exclusive economic zone, such as offshore oil exploration or fishing rights (see Cod Wars). Indeed, the exclusive economic zone is still popularly, though erroneously, called a coastal nation's territorial waters. Article 76 gives the legal definition of continental shelf of coastal countries. For the physical geography definition, see the article continental shelf. The continental shelf of a coastal nation extends out to the outer edge of the continental margin but at least 200 nautical miles (370 km; 230 mi) from the baselines of the territorial sea if the continental margin does not stretch that far. Coastal states have the right of exploration and exploitation of the seabed and the natural resources that lie on or beneath it, however other states may lay cables and pipelines if they are authorised by the coastal state. The outer limit of a country's continental shelf shall not stretch beyond 350 nautical miles (650 km; 400 mi) of the baseline, or beyond 100 nautical miles (190 km; 120 mi) from the 2,500 metres (8,200 ft) isobath, which is a line connecting the depths of the seabed at 2,500 meters. *a series of lines joining points not more than 60 nautical miles apart that is not more than 60 nautical miles from the foot of the continental margin. The foot of the continental slope is determined as the point of maximum change in the gradient at its base. The portion of the continental shelf beyond the 200 nautical mile limit is also known as the extended continental shelf. Countries wishing to delimit their outer continental shelf beyond 200 nautical miles have to submit scientific information for the basis of their claim to the UN Commission on the Limits of the Continental Shelf. The Commission then validates or makes recommendations on the scientific basis for the extended continental shelf claim. The scientific judgement of the Commission shall be final and binding. Validated extended continental shelf claims overlapping any demarcation between two or more parties are decided by bilateral or multilateral negotiation, not by the Commission. Countries have ten years after ratifying UNCLOS to lodge their submissions to extend their continental shelf beyond 200 nautical miles, or by 13 May 2009 for countries where the convention was ratified before 13 May 1999. As of 1 June 2009, 51 submissions have been lodged with the Commission, of which eight have been deliberated by the Commission and have had recommendations issued. The eight are (in the order of date of submission): Russian Federation; Brazil; Australia; Ireland; New Zealand; the joint submission by France, Ireland, Spain and the United Kingdom; Norway and Mexico. Articles 77 to 81 define the rights of a country over its continental shelf. A coastal nation has control of all resources on or under its continental shelf, living or not, but no control over any living organisms above the shelf that are beyond its exclusive economic zone. This gives it the right to conduct hydrocarbon exploration and drilling works. From the eighteenth century until the mid twentieth century, the territorial waters of the British Empire, the United States, France and many other nations were three nautical miles (5.6 km) wide. Originally, this was the length of a cannon shot, hence the portion of an ocean that a sovereign state could defend from shore. However, Iceland claimed two nautical miles (3.7 km), Norway and Sweden claimed four nautical miles (7.4 km), and Spain claimed 6 nautical miles (11 km; 6.9 mi) during this period. During incidents such as nuclear weapons testing and fisheries disputes some nations arbitrarily extended their maritime claims to as much as fifty or even two hundred nautical miles. Since the late 20th century the "12 mile limit" has become almost universally accepted. The United Kingdom extended its territorial waters from three to twelve nautical miles (22 km) in 1987. During the League of Nations Codification Conference in 1930, the issue of establishing international legislation on territorial waters was raised, but no agreement was reached. the Government of the United States regards the natural resources of the subsoil and sea bed of the continental shelf beneath the high seas but contiguous to the coasts of the United States as appertaining to the United States, subject to its jurisdiction and control. the Government of the United States regards it as proper to establish conservation zones in those areas of the high seas contiguous to the coasts of the United States wherein fishing activities have been or in the future may be developed and maintained on a substantial scale. Following the US Presidential proclamation, the issue of legally determining territorial waters by international agreement was raised, and in its first session in 1949, the International Law Commission of the United Nations added the subject to its agenda. The important issue of the breadth of territorial waters could not be resolved at either the UNCLOS I (1956-1958) or UNCLOS II (1960) conferences, with neither the two major contenders of a 3-mile or 12-mile limit reaching the required two-thirds support. This lack of agreement had the potential to lead to serious international disputes. It was only at the UNCLOS III (1973-1982) conference, whose provisions did not come into force until 1994, that this issue was resolved at twelve nautical miles. Pirate radio broadcasting from artificial marine fixtures or anchored ships can be controlled by the affected coastal nation or other nations wherever that broadcast may originate, whether in the territorial sea, exclusive economic zone, the continental shelf or even on the high seas. Thus a coastal nation has total control over its internal waters, slightly less control over territorial waters, and ostensibly even less control over waters within the contiguous zones. However, it has total control of economic resources within its exclusive economic zone as well as those on or under its continental shelf. Throughout this article, distances measured in nautical miles are exact legal definitions, while those in kilometres are approximate conversions that are not stated in any law or treaty. Maritime controversies involve two dimensions: (a) territorial sovereignty, which are a legacy of history; and (b) relevant jurisdictional rights and interests in maritime boundaries, which are mainly due to differing interpretations of the law of the sea. 3 nautical miles (5.6 km; 3.5 mi): Jordan, Palau. 12 nautical miles (22.2 km; 13.8 mi): Albania, Algeria, Angola, Antigua and Barbuda, Argentina, Australia, Bahamas, Bahrain, Bangladesh, Barbados, Belgium, Belize, Brazil, Brunei, Bouvet Island, Bulgaria, Cambodia, Cameroon, Canada, Cape Verde, Chile, People's Republic of China, Republic of China, Colombia, Comoros, Cook Islands, Costa Rica, Côte d'Ivoire, Croatia, Cuba, Cyprus, Democratic People's Republic of Korea, Democratic Republic of the Congo, Denmark, Djibouti, Dominica, Dominican Republic, Ecuador, Egypt, Equatorial Guinea, Eritrea, Estonia, Faroe Islands, Fiji, Finland, France, Gabon, Gambia, Georgia, Germany, Ghana, Grenada, Guatemala, Guinea, Guinea-Bissau, Guyana, Haiti, Honduras, Iceland, India, Indonesia, Iran, Iraq, Ireland, Israel, Jamaica, Japan, Kenya, Kiribati, Kuwait, Latvia, Lebanon, Liberia, Libya, Lithuania, Madagascar, Malaysia, Maldives, Malta, Marshall Islands, Mauritania, Mauritius, Mexico, Micronesia, Monaco, Montenegro, Morocco, Mozambique, Myanmar, Namibia, Nauru, Netherlands, New Zealand, Nicaragua, Nigeria, Niue, Norway, Oman, Pakistan, Panama, Papua New Guinea, Poland, Portugal, Qatar, Republic of Korea, Romania, Russia, Saint Kitts and Nevis, Saint Lucia, Saint Vincent and the Grenadines, Samoa, São Tomé and Príncipe, Saudi Arabia, Senegal, Seychelles, Sierra Leone, Singapore, Solomon Islands, South Africa, Spain, Sri Lanka, Sudan, Suriname, Sweden, Syria, Thailand, Timor-Leste, Tonga, Trinidad and Tobago, Turkey (in the Black sea and Mediterranean), Tuvalu, Ukraine, United Arab Emirates, United Kingdom, United Republic of Tanzania, United States of America, Uruguay, Vanuatu, Venezuela, Vietnam, Yemen. 30 nautical miles (55.6 km; 34.5 mi): Togo. 200 nautical miles (370.4 km; 230.2 mi): Benin, El Salvador, Peru, Somalia. Australia: A treaty with Papua New Guinea defines the territorial sea boundaries between the islands of Aubusi, Boigu and Moimi and Papua New Guinea on the one hand and the islands of Dauan, Kaumag and Saibai and Papua New Guinea on the other hand, as well as a section of the border of the territorial sea of Saibai. The territorial seas of the islands known as Anchor Cay, Aubusi Island, Black Rocks, Boigu Island, Bramble Cay, Dauan Island, Deliverance Island, East Cay, Kaumag Island, Kerr Islet, Moimi Island, Pearce Cay, Saibai Island, Urnagain Island and Turu Cay do not extend beyond 3 nautical miles from the baselines. Belize: 3 nautical miles limit applies from the mouth of Sarstoon River to Ranguana Caye. Cameroon: See article 45 of Law 96-06 of 18 January 1996 on the revision of the Constitution of 2 June 1972. Denmark: Act No. 200 of 7 April 1999 on the delimitation of the territorial sea does not apply to the Faroe Islands (the act applies to the Faroe Islands from 1 June 2002) and Greenland but may become effective by Royal Decree for those parts of the Kingdom of Denmark with the amendments dictated by the special conditions prevailing in the Faroe Islands and Greenland. As far as Greenland is concerned, the outer limit of the external territorial waters may be measured at a distance shorter than 12 nautical miles (22.2 km; 13.8 mi) from the baselines. Estonia: In some parts of the Gulf of Finland, defined by coordinates. Finland: Extends, with certain exceptions, to 12 nautical miles (22.2 km; 13.8 mi), unless defined by geographical coordinates. In the Gulf of Finland, there is a strip of international waters regardless of the 12 nmi limit: the outer limit of the territorial sea shall at no place be closer to the midline than 3 nautical miles (5.6 km; 3.5 mi). Bogskär, a remote island, has only 3 nautical miles (5.6 km; 3.5 mi) territorial waters. India: 13 nautical miles (24.1 km; 15.0 mi) limit includes Andaman, Nicobar Lakshadweep and SriLanka. Japan: 3 nautical miles (5.6 km; 3.5 mi) limit applies to the Soya Strait, the Tsugaru Strait, the eastern and western channels of the Korea Strait and the Osumi Straits only. New Zealand: 12 nautical miles (22.2 km; 13.8 mi) limit includes Tokelau. Papua New Guinea: 3 nautical miles (5.6 km; 3.5 mi) in certain areas. Peru claims territorial waters out to 200 nmi. Peru: The 200 nautical miles (370.4 km; 230.2 mi) territorial sea is called "Maritime Dominion" in article 54 of the 1993 Constitution: "... 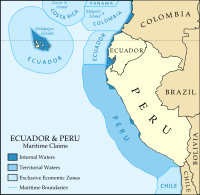 In its maritime dominion, Peru exercises sovereignty and jurisdiction, without prejudice to the freedoms of international communication, in accordance with the law and the treaties ratified by the State ..."
The Philippines claims a rectangle, defined by coordinates; the total claim extends beyond 12 nautical miles. Turkey: 6 nautical miles (11.1 km; 6.9 mi) in the Aegean Sea, 12 nautical miles (22.2 km; 13.8 mi) in the Black and Mediterranean Seas. United Kingdom and British Crown: The limit remains at 3 nautical miles (5.6 km; 3.5 mi) in some of its overseas territories: British Indian Ocean Territory, Gibraltar, Montserrat and Pitcairn; the limit is now at 12 nautical miles (22.2 km; 13.8 mi) in the United Kingdom and its overseas territories of Anguilla, Bermuda, British Virgin Islands, Cayman Islands, Falkland Islands, Saint Helena, Ascension and Tristan da Cunha, South Georgia and the South Sandwich Islands, and Turks and Caicos Islands, as well as in two possessions of the British Crown freely associated to the United Kingdom, i.e. Isle of Man and the Bailiwick of Jersey, but not in the Bailiwick of Guernsey where the limit remains at 3 nmi. 50 nautical miles (92.6 km; 57.5 mi): Democratic People's Republic of Korea; 50 nautical miles Military Boundary Zone. Army Command Announcement of 1 August 1977. As of 13 May 2009, 51 submissions by 44 countries have been lodged for claims over their extended continental shelf. Some countries have multiple submissions and joint submissions with other countries. Recommendations have been given for 8 of the submissions. List with date of submission and adoption of recommendation by the Commission on the Limits of the Continental Shelf. List in order of date of submission, with date of submission. ^ "UNITED NATIONS CONVENTION ON THE LAW OF THE SEA". Retrieved 27 April 2016. ^ "New Action to Protect & Preserve U.S. Shores & Oceans". Retrieved 27 April 2016. ^ "PREAMBLE TO THE UNITED NATIONS CONVENTION ON THE LAW OF THE SEA". Retrieved 27 April 2016. ^ a b Major Thomas E. Behuniak (Fall 1978). "The Seizure and Recovery of the S.S. Mayaguez: Legal Analysis of United States Claims, Part 1" (PDF). Military Law Review. Department of the Army. 82: 114–121. ISSN 0026-4040. Archived from the original (PDF) on 28 December 2016. Retrieved 21 July 2014. ^ Ji, Guoxing. (1995). http://escholarship.org/uc/item/7rq2b069 "Maritime Jurisdiction in the Three China Seas" (abstract), UC Berkeley: UC Institute on Global Conflict and Cooperation; retrieved 15 Nov 2010. ^ "Lov om afgrænsning af søterritoriet – retsinformation.dk". Retrieved 27 April 2016. ^ "Lógasavn". Retrieved 27 April 2016. ^ "41/1979: Lög um landhelgi, efnahagslögsögu og landgrunn". Alþingi. Retrieved 27 April 2016. ^ a b Executive order no. 48, Liberia Government, January 2013. ^ DLM means that "the national legislation establishes the limits of a given zone only by reference to the delimitation of maritime boundaries with adjacent or opposite States, or to a median (equidistant) line in the absence of a maritime boundary delimitation agreement". ^ "Laki Suomen aluevesien rajoista 463/1956 - Ajantasainen lainsäädäntö - FINLEX ®". Retrieved 27 April 2016. ^ "DoD Issuances Website: 404 Error Page". Archived from the original on September 20, 2012. Retrieved 27 April 2016. ^ "LIMITS IN THE SEAS NO. 32 STRAIGHT BASELINES : TURKEY" (pdf). U.S. Department of State. 25 March 1971. Retrieved 18 June 2016. ^ Park, Choon-ho (October 1978). "The 50-Mile Military Boundary Zone of North Korea". American Journal of International Law. 72 (4). Retrieved 25 November 2017. ^ Panda, Ankit (26 September 2017). "Would North Korea Shoot Down a US B-1B Bomber? Yes. Could It?". The Diplomat. Retrieved 25 November 2017. ^ a b "Submissions, through the Secretary-General of the United Nations, to the Commission on the Limits of the Continental Shelf, pursuant to article 76, paragraph 8, of the United Nations Convention on the Law of the Sea of 10 December 1982". United Nations Commission on the Limits of the Continental Shelf. 30 October 2009. Retrieved 9 December 2009. ^ UN confirms Australia’s rights over extra 2.5 million square kilometres of seabed. Archived 2009-10-25 at the Wayback Machine Minister for Resources and Energy, The Hon Martin Ferguson AM MP, Media Release, 21 April 2008. With map Archived 2009-05-14 at the Wayback Machine of areas. ^ "Ireland extends its underwater territory". RTE.ie. 23 October 2007. Retrieved 27 April 2016. ^ "Ireland can extend territorial waters". The Irish Times. 7 April 2007. Retrieved 27 April 2016. ^ UN confirms NZ’s extended seabed claim, New Zealand Ministry of Foreign Affairs and Trade. Updated 20 January 2009. Retrieved 29 May 2009. ^ "Submission by New Zealand". United Nations Commission on the Limits of the Continental Shelf. 8 April 2009. Retrieved 29 May 2009. ^ Gronewold, Nathanial. A Peek Inside the U.N.'s Continental Shelf Commission, New York Times, 14 September 2009. Wikimedia Commons has media related to Territorial waters.